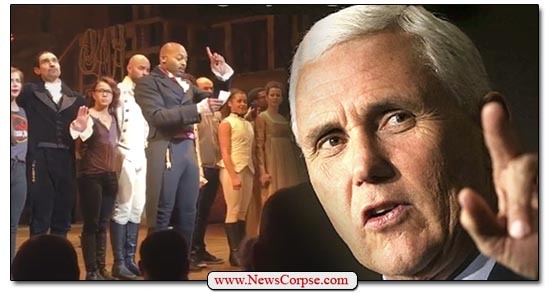 Friday night Vice-President-elect Mike Pence attended a performance of the musical “Hamilton” on Broadway. Judging from the audience reaction, his presence in the theater was not particularly welcome. There was noticeable and sustained booing. It’s a response that is consistent with the anger expressed by much of the country since Donald Trump’s unexpected victory. Protests are still being held on a nearly daily basis in cities nationwide. We have a guest in the audience with us this evening. Vice-President-Elect Pence, I see you’re walking out, but I hope you will hear just a few more moments. There’s nothing to boo here, ladies and gentlemen. There’s nothing to boo here. We’re all here sharing stories of love. We have a little message for you, sir. We hope that you will hear us out. Vice President-elect Pence, we welcome you, and we truly thank you for joining us here at “Hamilton, American Musical.” We really do. We, sir, we are the diverse America, who are alarmed and anxious that your new administration will not protect us, our planet, our children, our parents or defend us and uphold our inalienable rights. But we truly hope that this show has inspired you to uphold our American values and to work on behalf of all of us. ALL of us. Again, we truly thank you for staying for the show. This wonderful American story told by a diverse group of men, women, of different colors, creeds and orientations. Actually, the theater must always be a place that honors creative freedom and free expression. Once again, without any justification, Trump charges the cast with behaving rudely and demands an apology. Seriously? This is the same man who regularly calls people pigs, dummies, losers, sleazy, pussies, etc. Trump hardly has the moral authority to label anyone else rude. What’s more, he is notoriously averse to apologies himself. He has still never offered any after calling Mexicans criminals and rapists. Or for disparaging John McCain’s war heroism. Nor for insulting the Gold Star parents of a slain soldier. Or for boasting about committing sexual assault, accusing a political rival’s father of participating in the plot to assassinate JFK, encouraging violence against protesters at his rallies, mocking a disabled reporter, and so much more. Late Addition: Trump posted another tweet in his thin-skinned obsession with Hamilton. This one not only falsely maligned the cast, but also insulted them, despite being totally ignorant on the subject. Clearly he will be taking his juvenile boorishness into the White House. Trump’s reaction to the heartfelt and undeservedly polite commentary at the play is further proof of his lack of presidential temperament. He only registers anger and hostility when he perceives criticism. And he lies in order to cast aspersions on his critics. Then he responds by proposing censorship and suppression of free speech. It’s been less than two weeks since election day and Trump is already proving to be a national embarrassment.